Once a profile is published you can view, print, save, download as a pdf or clone that profile. Immediately on publishing the profile you get a link to View Profile. Clicking that link will take you to the profile where you can see links to Print, Download or Clone the profile, in the blogs admin bar. Clicking Print will print the page as it appears in the browser. Download will download a pdf of the profile. NB, the pdf may be more suitable for printing that the browser page. In the browser page, video and embedded content will appear as an image, in the pdf they will be represented but a URL. 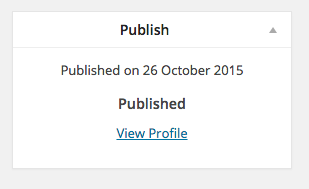 Clone will allow you to make a draft copy of the published profile that you will be able to edit. You can also View (and then print), Download and clone your profile from the All Profiles page.